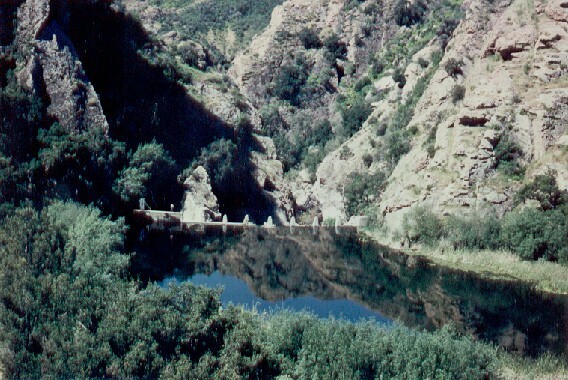 This entrance to Malibu Creek State Park is from Las Virgenes Road, 2/10 of a mile south of Mulholland Highway. A fee is required for parking. This hike will take us along the floor of the valley, then up a hill and down into a valley known as the Reagan Ranch. Drive through the gate at the attended entrance and go west on the road into the Park. Park in the second lot and start hiking. The first mile is relatively level on a good road. Las Virgenes Creek comes down from the north joining Stokes Creek, which in turn enters Malibu Creek. We will cross Las Virgenes Creek, and in about 5 minutes take a right fork (High Road) along an oak lined lane on the north shore overlooking the creek. The Low Road bridge has been out of use for some time so we make a note of the present condition so that we will use the High Road if needed. Movie sets for "Planet of the Apes" and many other films were built in this area but have been removed so the Park can return to a natural state. The Low Road comes in from the left after crossing a bridge; keep to the right and start winding uphill. This road tops out in about fifteen minutes, opening up a view of Century Lake and the Malibu Creek valley to the northwest. Goat Buttes on the west of the lake were produced about 15 million years ago under the sea by volcanic action, then later were forced up during the time when the Santa Monica Mountains were formed. Continue along the road as it starts downhill toward the shore of Century Lake. In a couple hundred yards turn sharply to the right on Lookout Trail. This trail takes us uphill around the south, then the east shoulder of a hill before heading northwest to the ridge overlooking the upper valley. Fifteen minutes after leaving the road we should be on the crest of an oak covered ridge. Turn right and gently drop down an enchanting trail deep in Oaks, Laurel and high Chaparral. The fire of October 1982 burned the chaparral on this slope, and the recovery is good. The trail is restored to the shaded canopy of trees that it once had. Look for a clearing on the left; the chances of seeing deer are good. The trail enters a grassy meadow, covered with flowers in spring but very dry in summer and fall. Looking northwest, the grassy strip stretches 3/4 mile and we should see the Park buildings near the far end. The trail passes a small grove of Coast Live Oaks. An Indian mortar, once used in the grinding of acorns, can be seen in a flat sandstone rock. The trail keeps to low ground at the edge of the meadow as it gently climbs northwest Some Golden Currant bushes are growing on both sides of the trail. The plants bloom in late March and April putting on a rare display. A few hundred yards farther along, the trail nears what was once a pond on the right. A restroom is available at the turnaround point. Return on the same trail until we have an opportunity to go right and get on the trail paralleling the one we came up on. This trail stays in the shade of Oak trees, passing through the picnic area of the ranch. The remains of an old barbecue pit mark the site of earlier outdoor gatherings. Good lunch stops are found along this stretch of the trail where even a large group can relax in the shade of trees or the sun of open areas. Cross Udell Creek farther along, then a gentle climb of less than ten minutes places us on a ridge overlooking Century Lake. At one time we walked downhill on the steep "cat track" toward the Lake but serious erosion required rerouting, and during the spring of 1985 a volunteer Sierra Club crew built the Cage Canyon Trail. At the "overlook" turn left and intersect the trail we came in on, then turn right. In about 100 yards turn right again, onto Cage Canyon Trail, which winds down to Century Road near the lake. Turn left and return on the road by which we entered.